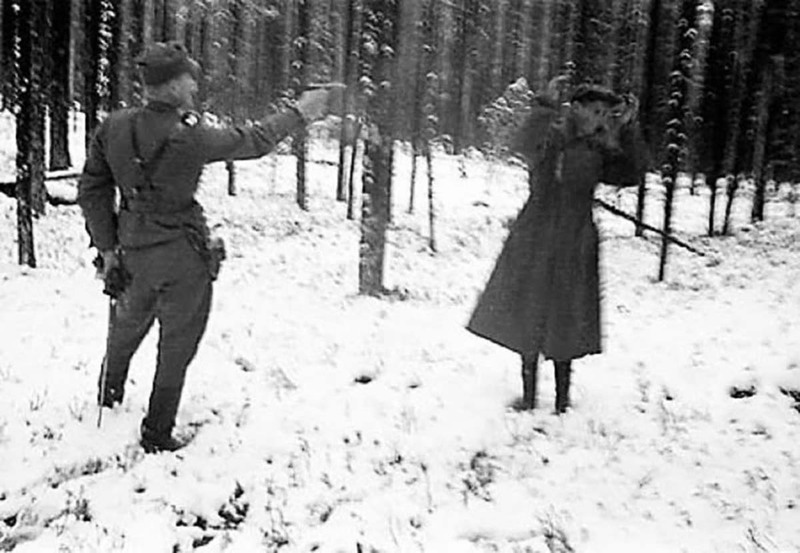 Russian spy laughing through his execution in Finland, 1942. 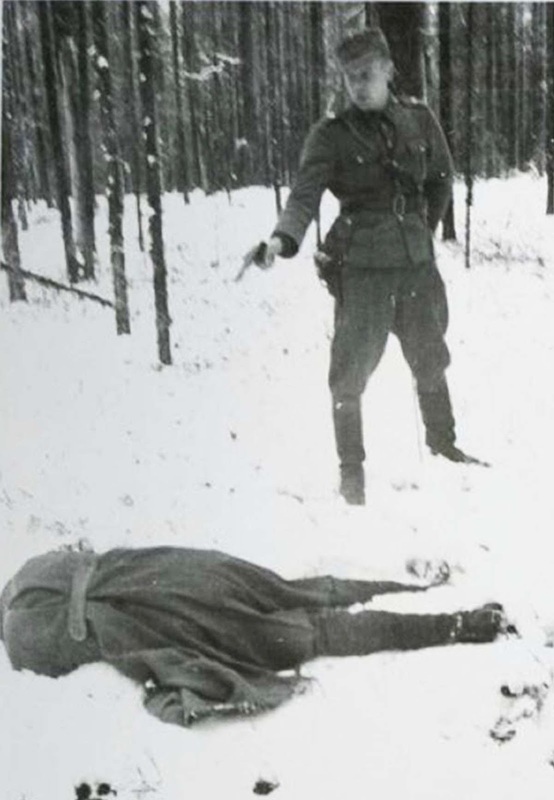 A Soviet spy laughs at his executioner in a picture taken in Rukajärvi, in East Karelia, in November 1942. It has been thought within the Finnish Defence Forces that the decision to withhold pictures of the fate of Russian POWs and spies may also have been prompted by concerns that pro-Soviet elements in Finnish society could have used the images for propaganda purposes. This picture was declassified by the Ministry of Defense of Finland in the 2006, with the description: Unknown Soviet intelligence officer before being shot, Finland, 1942. It’s a pretty amazing picture. To capture the last few moments of life. He knows he will die in a few seconds, in a forest in the snow. And there he will bleed out and be forgotten. His life, his experience, has come to an end. What else could he do but smile? That smile was his final defiance. Death smiles at us all, all a man can do is smile back. This picture was declassified in 2006. Of note Finland was allied with Germany and at war with USSR. This is the Continuation War, not the previous Winter War. By 1942 Finland was involved in the blockade of Leningrad (that starved to death 1 million civilians). Finland was not that involved, to be exact they refused to assist with the siege directly even though their frontlines were just about 30km away. World War Two for Finland was the Winter War (Soviets invade Finland, Finland fights until it almost literally has no more ammunition left in Finland so they have to negotiate a peace where they lose territory which the Soviets were glad to accept since they had lost so many people – meanwhile, the other democracies of the world initially help Finland since the Soviet Union is one of the “bad guys” – allied with Nazi Germany), the Continuation War (Finland allies with Nazi Germany to take back territory lost in the Winter War – meanwhile, other democracies are placed in an awkward situation since now, the Soviet Union is one of the “good guys” since the Nazis backstabbed the Soviet Union) and the Lapland War (Finland negotiates separate peace with allies on fairly favorable terms – since the western allies realize that the Soviet Union is actually not a “good guy” but an “enemy of my enemy” – and kicks Nazis out of Finland). it's more an existential response than political, Anna. Russians are human beings, too. Those bastards? We are a 99% smaller contry and they invaded us, slaughtered our soldiers (well we killed more of them) and burned our homes. Not all russians are bad but a lot are. For example you cant trust the police there at all. Incredible reaction, must have been his way of expressing nervousness, the way many people laugh nervously when confronted with an uncomfortable situation. A Soviet looking down the barrel of a Finnish soldier's weapon had to be in unimaginable terror. I think Finland was the only country to be involved in threee distinct wars (Winter, Continuation and Lapland) within the timeframe of WW2. The Russian wasn't laughing, he was just trying to say "wait!" in Finnish ... Aaaeeeiiiooouuuyyy! He can laugh, but you can't deny it he deserved it. To be fair to the USSR - not as many people keep saying "the Russians" dammit - they were fighting a qualitatively superior, well dug-in force on its own turf. Finland was being supplied in the first war by both the Allies and the Axis, during the second these combined forces on a total war footing were never successful in their main objectives of cutting off Leningrad and capturing Murmansk, northern Russia's only year-round sea port. The reasons why the USSR attacked are old as time itself - they saw the encroachment of the Germans as a threat and wanted once again, as theyve done in the Finnish peninsular during wars with Sweden, to create a politically neutral physical buffer zone. "Finland was being supplied in the first war by both the Allies and the Axis"
You must have read that from Soviet history books. At the time it was the USSR who was allied with Germany and Hitler certainly was not helping Finland but instead even forbade any help going through Germany. (Remember the Molotov-Ribbentrop Pact and the occupation of Poland, the Katyn massacre?) And any help that actually reached Finland was very little and not even close to being enough. To make Finland "a politically neutral physical buffer zone" would have basically meant killing all Finns, which is probably what Stalin wanted to do and had already started doing by killing ethnic Finns in the Soviet Union during the 1930's. Also the Finnish troops were only 30 km from Leningrad for 2.5 YEARS without even trying to attack the city. And if Mannerheim had wanted, the Road of Life could have been easily cut. So there were plenty of people in Leningrad who owed their survival to Mannerheim. You are incorrect - Finland received a great deal of direct and indirect support from both the Allies and the Axis, you can read about it at this decidedly not Soviet wiki entry, with sources and even uncomfortable truths of Mannerheim patronage by the Nazi regime. We russians have always believed that the invasion of Poland happened for the exact same reason as that of Finland. We saw what German blitzkrieg looked like in the lowlands of europe. Molotov no doubt had Stalin read Mein Kampf. We knew we were next, we were not ready, we needed to play for time. Ill make no apologies for that. I admire Mannerheim for refusing to bomb Leningrad, but maintain it was the Germans inept defense of the Volkhov line (who were lucky to have the spineless Vlasov ignored by Stalin) that convinced him an occupation of the city would be beyond Finnish means. Much less the continuously nebulous possibility of a joint assault on Murmansk. The history books arent too clear on his motivations here but everyone seems to like the idea that the Germans were counting on sharing this burden as they drove, presumably, into the Urals, and Mannerheim had no intention of holding Soviet territory. Something ive discovered as i grow older is just how selective "western" historians are when writing about the war. Noone for example seems to think that the Jaegers were of considerable help to the Germans, but i would disagree. If anything, Mannerheim would have been a Trump-like figure, opposed ideologically and in terms of war goals, with most of his executive staff. Jaeger training and anti-Russian (thats right, it all started with Imperial Russia) sentiment was cruicial during the Finnish Civil War. And with the majority of officers in the Winter War having such a background, that letter from Mussolini asking Hitler for permission to send Italian troops, rather than simply sell the Finns materiel, didnt get a reply until the Finns weres securely pushing the Soviets back months later. Now im not saying this is the only truth - it was a complex time for everyone, and considering the state of the Soviet military at the time, I think things couldve been much, much worse. So, you condemn the Finnish allegiance with Germany to reclaim their own land taken by a foreign invader, yet you approve of the Soviet invasion of Easter Europe (Finland, the failed Soviet Polish war after WW1 and the later successful invasion of Eastern Poland, all the Baltic states) as merely logical defense? And after this you call "western" historians selective? You also condemn Finnish jaeger movement for independence and that the Finns cut of some supplies that would have armed their hostile forces, but do not care to mention the ethnic cleansings done by Stalin against the many ethnic Finns, Karelians, Ingrians and Estonians who lived around the Leningrad areas? You are correct that the USSR was not "the Russians". This is a unfortunate and extremely common misconception people have of the Soviet Union. You can easily clear this misconception by looking at the Soviet deaths by ethnicity during World War 2 and you can see that percentage wise many other ethnicities had more military casualties within the Soviet army than Russians. However, the exact statistics are impossible to find as they vary from one source to another, but the general point of Soviets=Russians can be proven to be untrue even with these statistics. I am not debating for either side just pointing out your own hypocrisy after you got on your high horse. You should read some Socrates and learn some humility from him for there is great wisdom in admitting one's own mistakes and submitting to more persuasive and well-rounded arguments. As a historical note, USSR tried to buy the territory before Winter War, for a good price. War with Germany was just ahead, and Leningrad was too close to the border. Finland rejected all offers, they knew who their ally will be and who must not be helped in any way. The Soviets wanted to "buy" Finlands second biggest city alongside a very important territory around it in exhange for a worthless lowly populated territory that was mainly a forest. Finland never wanted to ally with Hitler, but they had no one else to turn to, its not like other democracies would have been able to defend Finland. Oh please. USSR did offer these "assistance treaties" to Finland and the Baltic States. The Baltic States had agreed to the deals but USSR then invaded them anyway as it had planned all along. And yes, Finland didn't take the deal and USSR then invaded Finland but wasn't that successful. Point being that the USSR still would have invaded Finland even if Finland had agreed to the deal. If Finland had agreed, that would have just made the invasion easier for the Soviets which would have been a pretty dumb move from Finland. And, as I said, the USSR planned to invade anyway which can be seen in the Molotov-Ribbentrop pact and its secret protocol where Germany and USSR had placed Finland, Estonia, Latvia and later Lithuania (part of it) under the USSR influence. And USSR had already made an invasion plan to invade Finland before the negotiations even took place. The Soviets were as bad, if not worse, than the Nazis. I have no problem with either of them being executed. Death to Soviets and Nazis. This photograph haunted me two days. I think perhaps he did not know he was about to be killed. Or he did not want to believe. Of course he knew. That was the sentence for spies, he knew that even before he left that if caught, he would be killed. It takes a brave person to actually laugh at their executioner. I'd be scared they might decide to make my death more slow and painful. Depends on where you would face the said execution. Finns were not in the habit of making the death drawn out and painfull, executions were quick and simple business. At shortest, tent court would hand out execution sentence and condemned would be taken couple hundred meters from the tent and be shot straight away. But this was only for male spies and partisans, though majority of them were able to commit suicide before capture. 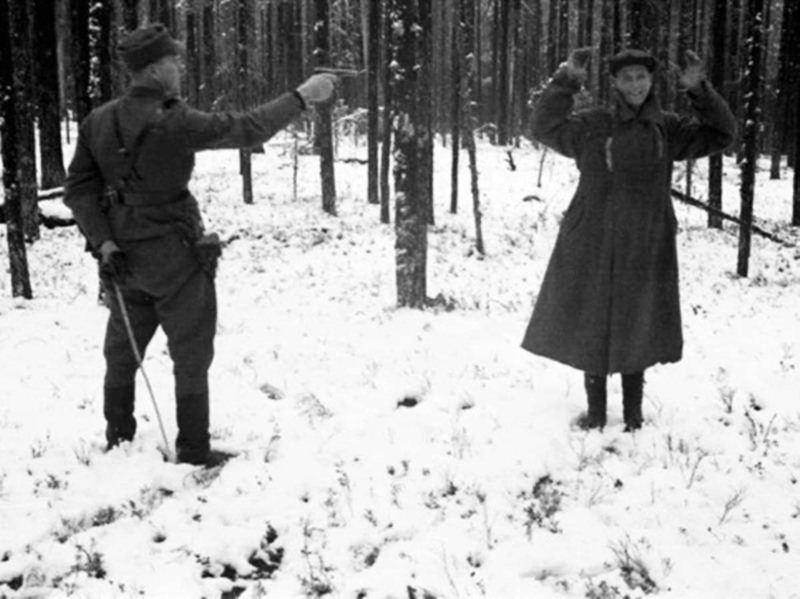 Female spies and partisans were mostly condemned to life in prison. Most, if not all, countries in second world war executed spies/partisans fighting without military outfit (loose term) behind the friendly lines. These days, the term might be 'illegal combatant'. Dmitry V. is typical russian. They think that Germany was threatening them and because of that they had to invede Finland and Poland. Now they have invaded Ukraine, Georgia. And for what? Only to prevent those countries to join Nato. This man is my hero. I only hope I can meet my demise as well as he did. Nostrovia, to you my friend. Actually, he saw the cameraman with his camera getting ready to take his photo, he was in the process of posing for the photo but unknown to him the soldier to his left was at that moment aiming to fire a revolver and did so, if you look at the death photo he was still smiling when the bullet struck. I wish he had lived, like all war deaths his killing was just another fruitless sacrifice. For whats its worth the West would have been much better off allowing the Nazis to conquer Russia, eventually the Hitler regime would have toppled, and beforehand we would have liberated Russia, and created a huge German run Canada. Goodbye Comrade Stalin, and Communism.